The Woodlands, Texas is a fast growing master planned community 28 miles north of Houston along Interstate 45. With a growth rate of over 65% over the last 15 years, much of the community has retained the trees of this heavily wooded area for shade and decoration. And while this growth is highly celebrated by residents in this bedroom community, there is a different kind of growth that is not near as exciting or appreciated. It’s the growth of roof stain due to humidity, rain, limestone shingles, and the spreading of these stains from one residence to another through air born spores. 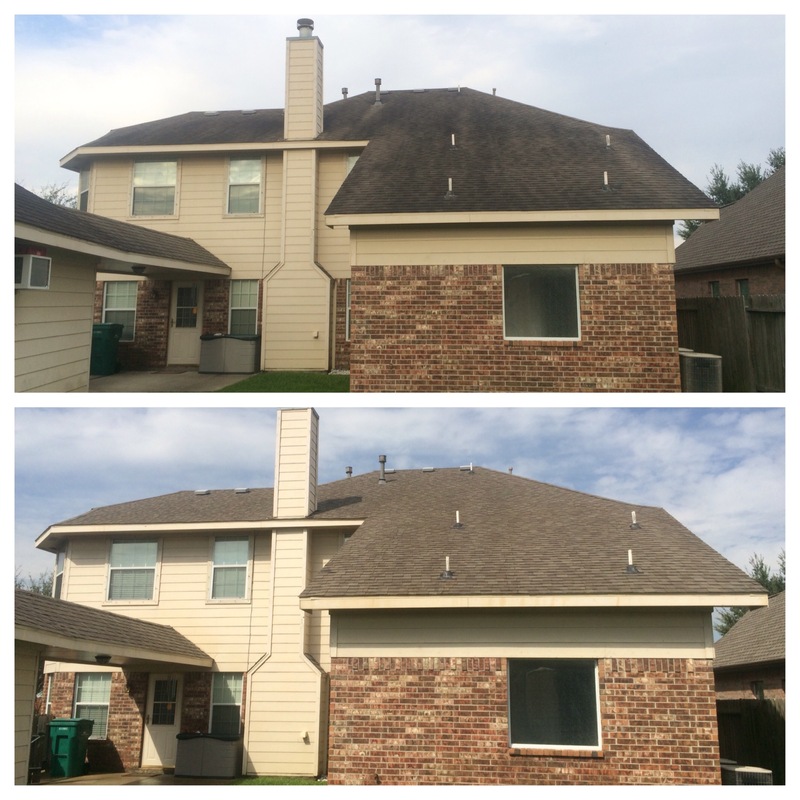 This obstrusive algae is what creates black streaks that some refer to as mold or mildew and results in the need for our Roof Stain Removal The Woodlands, Texas community. Many residents may resort to pressure washing for roof stain removal in The Woodlands, Texas, not realizing they are actually causing damage to their roof by eroding the “gritty” shingles, thereby greatly reducing the lifespan of the roof. The safest option for Roof Stain Removal is to use our SOFT WASH no pressure cleaning process that attacks the algae without damaging the shingle, or the environment. This unique Roof Stain Removal solution is sprayed on with less pressure than a garden hose but immediately kills the algae on contact, which most likely will not return for at least three to seven years. You’ll see visible results within five to ten minutes of us applying our Roof Stain Removal product to your roof. Some have referred to our beautiful community as a sanctuary nestled deep inside a native forest, and roof stain removal in The Woodlands, Texas is highly needed to maintain the natural beauty of this diverse and growing community. Your roof can be quickly, easily and very affordably restored to it’s original appearance, looking like new with our soft wash, Roof Stain Removal The Woodlands Texas no pressure approach! 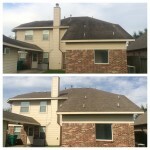 For more information on our Roof Stain Removal process and procedure, call or text us today at 2818838470. We will be happy to discuss with you and provide you a quote right over the phone. Clean and Green Solutions is a Certified Roof Cleaner of the UAMCC.